My first tattoo was no small flash in a fleshy part of the body or a tribal band around a low-nerve region: it was thick, dark, and required the needle gun to run up my collarbone. The vibration scraped down to my sternum. All of this was manageable as I’d zoned out like the body and mind mandates when undergoing sustained pain. Then when my artist pulled the gun away and turned her back I relaxed and smiled, pleased we were done. Not too bad. Of course, I was wrong. She was just reloading. The next minutes were excruciating as I worked to get back to that happy place but my mind wouldn’t make the leap. Like it was saying “boy, this wasn’t the deal. You bamboozled me and now we both have to hurt for it.” But I didn’t know: one, this was all new to me, and two, I couldn’t see to verify (try looking at all your clavicle without a mirror). But after all the pain, it was worth it—my next dozen tats serve as confirmation. If you want to see the rest you’ll have to buy me dinner. I’m cheap, not free. The life of a writer (or my life as a writer, anyway) is full of rejection. Sharp needles jabbing into your ego, over and over again. Like that first tattoo, I don’t know when the pain will end. Worse, I can’t be certain it will turn out like I want—or that I’ll even end up with a visible result. As though there’s no ink in the gun, and I’ve endured it all for nothing. It stings. Especially when you go through the proper process: you read the blogs and articles that preach proper etiquette, you do your research and find agents who rep books that are similar but not too similar (and, of course of course, when you’re not writing you’re reading lots of books in your genre to know those matches), you meet them at conferences or query them on the basis of their MSWL or their recent interview or their tweets or agency profile that shows you two should be like peas and carrots and you tell them all this while sounding totally professional, not at all obsequious or stalkerish. You do all of this and it works, s/he requests the first 10 or 50 pages or even the whole damned book and you think, finally it is in a professional’s hands—I’ve made it through the hoops and now the writing will speak for itself. And they say they like it, just not enough. But keep going, they say, because certainly another agent will see it differently. Rejection hurts, especially after you believed. Rocky’s down on the canvas and it’s not the first time this fight. His nose was broken rounds ago. His eyes are swelling shut. He’s so battered that his own trainer tells him to stay down. Everyone has lost faith in him. But he gets back up. He wants it so badly that he has his cutman cut open his eyelid so that he can see for one more round (they don’t usually do that, you know—it’s like a firefighter setting a fire). Rocky goes the distance. The scorecards are irrelevant because all he wanted was to go the distance. To know that he was good enough. I find meaning in that. Rocky had one advantage over me though: he knew what the distance was. 15 rounds, they announced it up front, it was the standard length for championship fights at the time, even Lady Liberty carried around glittery numbered cards to remind you what round was coming (helpful as Rock was probably sustaining a large percentage of his overall brain damage). 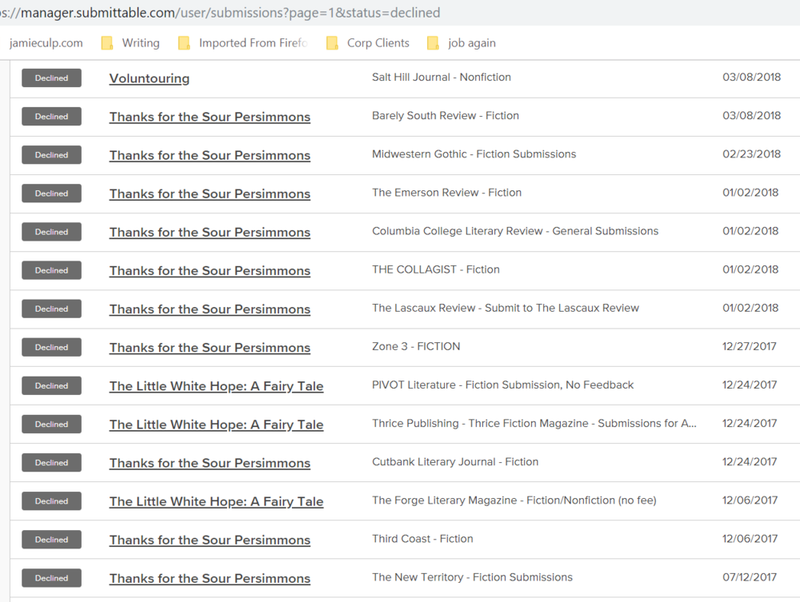 submittable is great because it lets you see lots of your failures on one page. Not one screen, mind you—this goes on for 72 entries. On the bright side: two of these stories have since been published. I don’t know what round I’m in. And these shots I’ve taken of late are a lot harder than the jabs from lit mags passing on my short fiction, or the glancing blows struck when agents respond to my slush pile query with a form letter or no response at all because I was all in on this. I was feeling like a contender, a somebody. Getting representation for my novel isn’t the title belt, but it’s a lot more than fighting Spider Rico. Is it going the distance? Because that won’t be enough. Of course, Rocky changed his mind on there not being a rematch and… okay, the analogy becomes a little tortured since success is a succession of fights, some lost, some won, all instructional.